Readers, hello! It’s been a busy few weeks and I am absolutely full of the cold (run down probably) and feeling a bit sorry for myself at the moment. I’ve made it from bed to the couch today, so you know, progress. I’d planned on writing my spotlight on the north east post yesterday, but the head was so far in a bin, there was zero point in trying. As most of you know my food and travel blog usually focuses on Glasgow, so I'm somewhere else! Today I wanted to share with you a spotlight on the north east of Scotland – sometimes forgotten, mostly rainy, a lot of granite is the reputation up in Aberdeen, but when we rocked up on Wednesday night after a drive of several hours, we were greeted by sunshine, warmth and a gorgeous looking townhouse for our Air BnB. Between 6 of us, it was £74 per couple, for 2 nights, which was an absolute steal for having our own space, big rooms and an area to chill in. For those of you wondering – we were up for a midweek wedding, so made a holiday of it, staying for a couple of nights to catch up with friends. We started our Aberdonian adventure, with brunch at Foodstory on Thistle Street. Proof that social media marketing works – I’ve followed these guys for ages and always wanted to go, so when we discovered our accommodation was a mere 15 minute walk away, we made the effort to visit for brunch. In short, it’s VERY hipster. The menu is mostly veggie and vegan food (in fact it might all be). 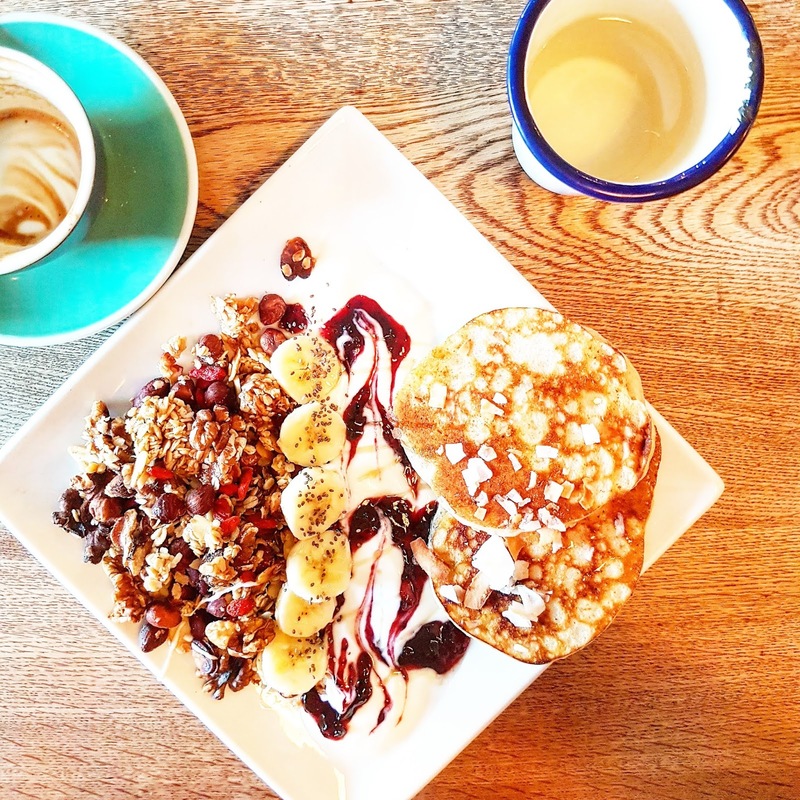 But 4 out of 5 of us had the superfood granola pancakes which were amazing. Around £11 per person for an incredibly filling dish and a flat white was great value and the food was so filling. I was defeated by the granola in the end and our 9.30am brunch filled us up right through to canapes at the wedding at 4pm. Feeling a bit worse for wear: “just really tired” after our celebrations at the McCaig wedding and being greeted by the all too familiar grey skies, we packed the car and made our way back to Glasgow late morning. We pulled off at Stonehaven to visit a couple of old haunts we hadn’t been to for years… not far off 7 years. Arriving in time for lunch, we visited Molly’s Café Bar (where we’d had a great Cullen Skink previously) which is a cozy beach café on Stonehaven’s promenade. It was packed with locals and visitors and was a very reasonable £20 for lunch for two. I tried their summer special raspberry iced tea… which was HUGE but delicious. 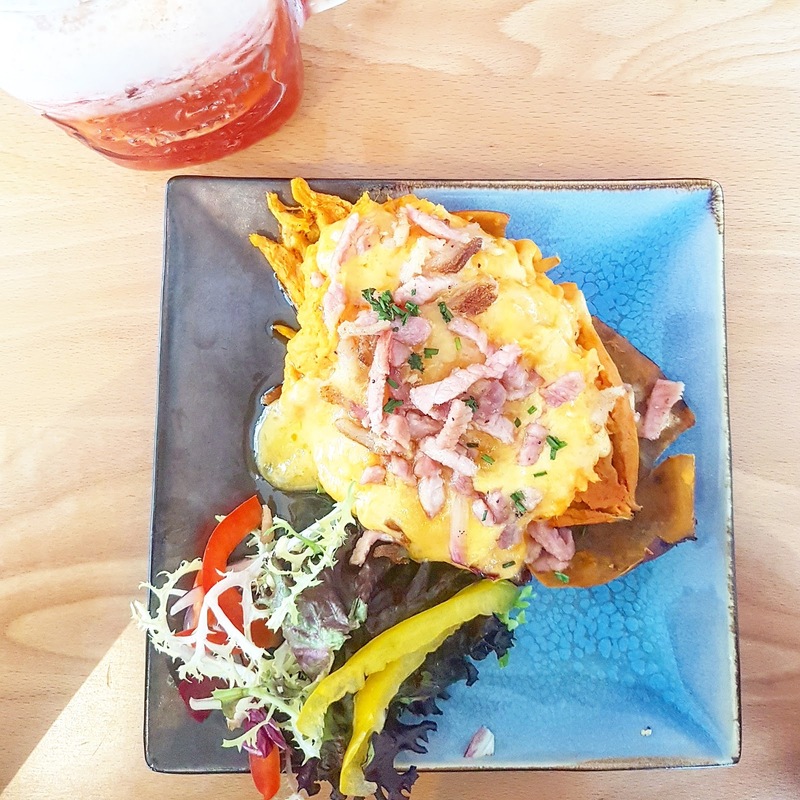 I went for a light bite choice for lunch – sweet potato skins with cheese and bacon. All to save space for my next stop off, two doors down. If you’ve never been to Aunty Betty’s in Stonehaven… YOU MUST GO. Old school sweet shop, meets ice cream shop, meets Mr Whippy, with all the toppings you’d ever want on your cone. The ice creams might seem a bit more expensive than your regular store, but all toppings are included in the price, so would absolutely encourage you to have every single topping you can with your cone. You won’t be disappointed. 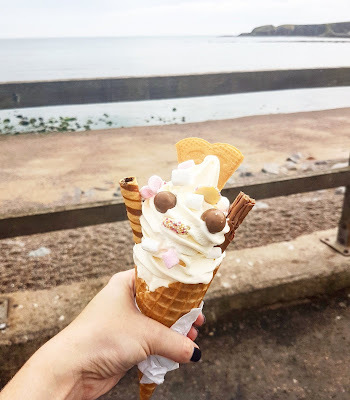 So there you have it folks, whether it’s a day trip or a short break you are on to Aberdeen, there’s plenty of great places to eat whether you’re headed up the coast, or back down again!